It may not be the most polished piece I’ve ever written… I’d like to think my writing has improved after all these years. But, I’d probably still argue it was an eerily accurate assessment of the industry I served, especially considering I’d never left the automotive service business we opened at the Cloverfield Blvd offramp to the Santa Monica Freeway in the late 1960’s to explore it. And, I’d still argue that it is perhaps the most important. It appears here, lightly edited and published publicly for the first time, after I referrenced it in the monthly column I write for Ratchet+Wrench: September 2014 issue. Whether the ultimate consumer of our goods and services or a professional taking his living from this industry, I’d be interested in what you have to say about it. I suppose that it has never really been a question of whether or not we would be able to fix all of these broken automobiles. After all, up until now, we have always managed to do so. However, in the changing environment and economy of the 1980’s this may soon change. The individual most responsible for the care and feeding of our automobiles has traditionally been the automotive service technician, or as he used to be called, the “mechanic.” Surely, we all remember that poor beleaguered individual, covered with grease, working late into the evening (because that car just had to be finished tonight! ), and being treated with about the same amount of respect and appreciation as a used car salesman or a recently paroled bunko artist. Well much like the American eagle, the whale, or the California condor, the “Automobile Mechanic” is quickly becoming an endangered species. I fear that we can take for granted no longer the availability at any corner service station, dealership or independent repair garage, of a trained and responsible automotive technician to “fix” that car! Everyone that I have spoken to: independent garage owners, service station operators, dealership service managers, equipment representatives and professional trainers all seem to realize that “Good Wrenches” are becoming more and more difficult to find. Not too terribly long ago, an article in one of the National Trade Publications, based upon Department of Transportation figures, put the short fall number at an incredible sixty thousand men. An awesome number… sixty thousand. Sixty thousand is a lot to be short of anything. Sixty thousand trained technicians in the field is entirely too many to be short and the number is increasing all the time. I am an independent garage owner and service station operator from Southern California. I take the responsibility of addressing this Meeting of the Equipment and Tool Institute very seriously. I realize how rare it is that a person, such as me, has the opportunity to address such a distinguished and influential audience. It is my belief that this opportunity, this audience, and the state in which we now find our industry demands that we engage in some plain, straight, and honest dialogue. For quite some time now, I have been speaking to mechanics and garage owners alike, trying to achieve the broadest perspective possible in order to better understand our industry and its problems. In my conversations and through my observations, I have come to the conclusion that we are facing a crisis within our industry. I also believe that the time to face this crisis is NOW! It is a crisis that will or has already affected every corner of our industry. It is a crisis which is apparent in every State of our Nation. It has come to affect the automobile manufacturers as well as their respective dealership organizations. It has come to affect every automotive service technician who turns a wrench professionally and most important, it affects every person who owns, operates and maintains an automobile. Because, after all, it is this person for whom we all work…. The crisis which we face is deceptively simple. The pool of trained personnel in the field has been slowly evaporating; the number of technicians gets smaller every day! Like many of the so called “simple” problems we face today, however, the solution can be anything but simple. In this first portion of my address, I will try to establish and define these problems and their causes. 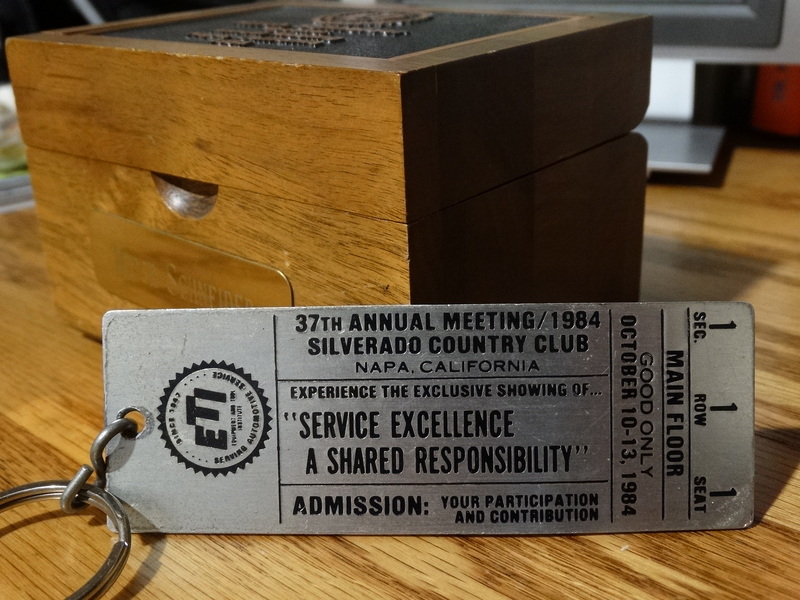 I feel that in some respects, I am uniquely qualified to comment on the “State of The Industry.” I am the fourth generation in my family to be involved in the automotive service aftermarket in some way, and the third generation to be actively involved in the repair end of the business. My family represents a technological span that includes the horseless carriage as well as the micro-processor. I am a Certified Master Technician with the Automotive Service Excellence and was certified with the old Certified Automotive Repairmen’s Society before that, as well as being a Union Oil Certified Master Technician. I possess all the necessary licenses and education that one needs to both function and compete effectively in our trade at this time and I have also been employed as a professional instructor. Despite all of these qualifications, there are many times that I begin to feel like an embattled catcher, perhaps the only catcher, on a professional baseball team. Everything, and I mean everything that the automobile manufacturers throw at us, every new technology, every innovations and every modification, we must successfully field. The fast balls and the curve balls, the sinkers and the sliders, the braking pitches, the knucklers, and of course, the occasional screw ball! And these pitches all seem to be coming faster and faster!! To be one hundred percent frank with you, I have always looked at the job the professional automotive repair technician has done over the years with a great deal of admiration and respect, and more than just a little amazement. But who exactly is this automotive repair technician and how did he come to be involved in this business? There are a number of technicians who have come to us from the community college vocational education programs and some from the private vocational schools. Of that there can be no doubt. The majority of these technicians, however, have come to us straight from our high schools. Some graduated… some, not. And who are these people? Well, as far back as I can personally remember, the kids who got funneled into the vocational education programs and the shop programs in our high schools, with the rare exception of the few kids who really had a “calling,” or who were serious “street racers,” were the discipline problems and the truancy problems, the functional illiterates and ALL the other kids who the counselors, in their infinite wisdom, felt did not have the “academic inventory” necessary to make it in college then or now. The basic rule of thumb seemed to be… if the student could breathe, then he could most certainly fix a car! After all, we all knew that anybody could fix a car!!! All you needed to do was to go down to your local department store, buy yourself a “mechanic’s” tool box, call yourself a mechanic, and by G-d, someone, perhaps even someone with less knowledge than yourself, would give you a job! It seems some of those counselors were not able to foresee the basic skills which their students would need in order to read some of the new technical manuals, the sophisticated reading material in them, or the ability and concentration necessary to follow a diagnostic trouble shooting “flow chart”! Well, regardless of the number… or the quality of the tools you design and build, all the praying and good intentions in the world won’t help you fix a single car if you can’t read the manual or follow the flow chart! And what happens every time our economy hic coughs? What happens every time there is an influx into our midst of displaced aerospace workers, assembly line workers and others, who have at one time or another worked on their own cars, and now, faced with desperation, turn to our industry for relief. Well, the fact of the they managed to finish a valve job on their 1972 Chevy sedan, and it only took them six weeks, that they threw out all the extra nuts and bolts “cause they really didn’t need ’em anyhow,” and that, finally, they had to take that sedan to a trained and competent technician to get that sedan properly set up, does not make them excellent raw material for our industry. I can tell you quite honestly, there has been many an occasion where I have had to debate just such an individual as to his qualifications and as to whether or not he warranted journeyman level pay for those qualifications. I must honestly also tell you, that on more than one such occasion I have given an individual the chance to enter our profession just so he could prove that ability. People are always coming into the shop to tell me of some bright, deserving young person I should hire and train because he or she is “mechanically inclined.” Well, I have been trying to determine just exactly what that means and all I can come up with is that a person who is mechanically inclined is a person who must be working on a hill! Along with the great number of those high school students and “drop-ins” ill prepared to struggle with the high tech nature of our industry today, we have also seen a tremendous influx of people who do not speak English as their first language and due to the critical nature of the manpower shortage which exists, find easy access to our industry. The language barrier which these individuals face brings with it a whole new world of frustration for both the trainee and for the one given the responsibility of his training. Think of all the idioms in the English language, that you and I might use without conscious thought, which make no sense at all to someone from outside our culture! I would, here, like to discuss a problem which on its own would merit the status of crisis in this or any other industry. I believe it is as critical a problem as any I have previously mentioned and perhaps even more critical. It may be that it is of even greater concern than the problem of attracting fresh, eager, bright young people into the profession. The crisis to which I refer is of the great number of Journeyman or Master level technicians presently leaving the profession every day to seek employment elsewhere in the society. Time and time again, I have seen excellent quality technicians, excellent quality diagnosticians, choose to opt out of this business. I suppose there are probably as many reasons as there are technicians leaving, but some of the most common reasons that I have been given are: the ultimate frustration of continually playing catch up with the ever growing, ever changing technology, the time and the patience which have become necessary just to communicate with the automobile owner today, trying to help him understand this insanely complex machine he must operate and maintain and trying to explain to him the new and different service requirements. For those of us in the independent sector, there are the added problems of being caught in a tug-of-war between the manufacturer, the dealership, and the consumer concerning specifically the five year, fifty thousand mile emission control component warranties, in which, if things continue as they have, more than likely everyone will lose. Still other reasons I have been given are the dangers which seem to be inherent in the very nature of what we do. The constant contact with known carcinogens, dangerous chemicals, caustics and fumes which are know to be toxic pollutants, not to mention the constant and immediate physical danger that we face in doing our jobs every day, day after day. Also to deal with is the frustration we face in trying to access parts placed in positions that are totally inaccessible. The reason, however, despite the validity of all those above, I am given most often is the “inadequate compensation.” The lack of equitable compensation for the years of training and hard work, the reading and the endless seminars and clinics, the striving to be good and the tensions and anxieties which go hand in hand with dedication of that sort. It does not seem an unreasonable request that a “technician of quality” be paid in proportion to his knowledge and skill, paid according to his value or his indispensability to the society he serves and keeps mobile. We are, after all, a nation which moves on wheels. How long could the nation survive as we know it, if its cars and trucks could no longer be repaired or maintained? How far could we get if the wheels stopped turning? They are, however, the hands of a dedicated and highly skilled craftsman. They are the hands of one who has spent years reading and watching and countless hours attending schools and clinics, seminars and meetings. They are hands which have spent years learning their skill and have subsequently spent still more years refining that skill. These hands have spent many days and many nights turning the pages of technical manuals, trade publications and technical service bulletins. They have made more than their share of telephone calls, around the country when and wherever necessary, in the interest of repairing a customer’s car. And while these hands may share the commitment and the dedication of a surgeon, and while it may take very bit as long to become proficient in the “art” of mechanics as it does in the field of medicine, accounting or law, the level of compensation is certainly not the same. Perhaps it is not so presumptuous to infer that a qualified technician should make as much money as a doctor or a lawyer. Every day when we go to work to do our jobs, we take the responsibility for the lives of our customers and the people around them in our hands. Every time that we do a brake job or work on a suspension system or touch a steering component, someone’s life depends upon our judgment, skill and ability. Certainly, the level of professionalism that it will become clear we must have in the 80’s or 90’s or beyond will demand higher salaries and greater professional respect if we are to retain qualified and talented technicians. There are many other pairs of talented hands across the nation we can ill afford to lose! It does not seem an unreasonable request then, that the technician’s pay should reflect the investment that he has in both time and tools reflect the level of his skill and ability. It does seem incredible, however, to those people, particularly those who have left the profession, that the assembly line worker, performing his limited task repeatedly, building an automobile, is paid more in salary and is given more in benefits than the highly skilled technician and diagnostician who is give the overall responsibility of repairing the WHOLE vehicle. It does not become difficult, then, to see why a person possessing the skills and abilities necessary to become a good technician; a keen and logical mind, the ability to deal in both concrete and abstract terms and concepts, discipline, perseverance, pride in workmanship, etc., etc., all of which are skills which would be welcome in any profession, would then sell his skills to the highest bidder leaving our profession behind. How many people here at this convention, I wonder, know of someone who has worked at some time as a technician, and then opted out for some of the reasons I have just mentioned? I personally know of more than few who have gone to work as training instructors or equipment salesman, who have found their way to jobs as Product Managers or into the field of Marketing. I suppose the most interesting case that I personally know of, and the most depressing, is one in which an excellent quality electronic fuel injection specialist, a person well respected in his field, left the profession to purchase a doughnut franchise… A doughnut franchise! He gave me a list of almost the identical reasons mentioned above for leaving. How many good technicians can we afford to lose? How many of the few can we afford to lose before the damage to our industry becomes irreparable? How many can we afford to lose before there is no one left to train the few who are coming in? How can we convince them to stay when the commitment in time and the commitment in tools, for both the garage owner and the professional technician alike are awesome, almost staggering? My business is typical of that kind of commitment. We have a six bay garage and a two bay service station, a fairly complete machine shop, three computerized engine analyzers complete with four gas, two of which are California Smog Inspection & Maintenance approved, computerized wheel balancers, alignment equipment, air conditioning charging stations, brake lathes, a distributor machine, cabinets filled with all the new and necessary hand held microprocessor based testers, and if all of this were not enough to test conventionally powered vehicles, we have had to fill the remaining cracks and crevices within the shop with a whole new cornucopia of diesel engine test and repair equipment. Add to this all the normal kinds of lifts, jacks, compressors, battery chargers and hand tools and you have a financial commitment which falls somewhere close the National Debt! If this commitment has become overpowering for the garage owner and service station operator, contemplate what it might be like for the young person who is attempting to get himself started in this trade. With the cost of hand tools what they are today, with the cost of a good, professional quality tool cabinet running in the hundreds or even thousands of dollars (and that is empty! ), and with the psychological, intellectual and spiritual commitment so high, it is no wonder that we lose the bright and the young to other endeavors. Our entry level pay scales have just not been able to compete with the supermarket chains or the factories, the trucking companies or the government for either salary or benefits. Something must be done NOW to keep these talented hands turning wrenches. No discussion of the problems we face in our industry every day could be considered complete without mentioning the phenomenon of stereotype and stigma. It sounds almost like the name of a law firm doesn’t it? Stereotype & Stigma. But the concepts these two words represent are no laughing matter. In fact, they are equally responsible for our inability to attract young people into our profession as much as much as they are responsible for causing too many seasoned technicians to leave. I would hope that we might all agree that most of the bad press we receive, at least insofar as blatant automotive service industry “rip offs” go, are for the most part unjustifiable. Many years ago, I read a study which statistically established the fact that the greatest problem we faced as an industry was not unscrupulous dishonesty. It quite emphatically made the point that, as an industry, we were not dishonest. It did make the point, however, that there were so many of us who were incompetent; we just seemed to be dishonest. We seemed to be dishonest through the replacement of unneeded parts through faulty diagnosis. We seemed to be dishonest through an inability on our part to explain to our clients, intelligently, and in terms which they can understand, exactly what their problems might be. We also seemed to be dishonest because the machine we work on is an extremely complex and puzzling beast. And because it cannot communicate with us directly. As reassuring as it was to read this study, it still does not help to over come the initial hesitancy you can read on a new customers face when he enters your shop and looks at you for the very first time with a look that says, “I know I’m gonna get it now!” It also does not help when you are trying to build a new trainee’s self-image or his professional self-esteem. When it comes to a discussion of incompetence, I must share with you some of the experiences I encountered while teaching a Smog class for one of our industry’s major equipment manufacturers. The class was an accelerated Smog class and the people who were enrolled were supposed to be Journeyman level technicians. Because of the nature of the material and the condensed time frame, some of the concepts were to have been deleted, being considered too basic in nature to take class time with. It seemed in every class I taught; there were huge, gapping holes in the theoretical knowledge of the students. When attempting to discuss electronic ignition, for instance, it seemed inevitable that we would have to stop and first explain basic, point type ignition systems and their operation, something that was presupposed to have already been known! It was my experience that these kinds of occurrences were more the rule than they were the exception. The reason I bring this up now is simple. It is to show that, if in fact, these were Journeyman level craftsman; we are in far worse trouble than anyone could possibly have imagined! Most of the surveys and research papers I have read recently have shown a measure of change in the attitude of the consumer toward the technician. It is finally becoming realized that it takes more skill than it used to be able to diagnose and repair an automobile today. It may even be that, for perhaps the first time, our profession is beginning to be perceived as a profession by individuals outside the industry. To a large degree, this change in perception may be too little, too late. The stereotype of the “grease monkey” may be dying, but the damage of that stigma still remains. How many of you share this experience with me. You are at a cocktail party at a friend’s home, and having met some one new, a “friend of a friend,” you find yourself deeply locked in a very engrossing conversation concerning politics, religion, finance or philosophy when the inevitable question of occupation comes up. Have you ever noticed that once you inform this person that you earn your living repairing automobiles, his whole attitude toward you changes? Have you found that suddenly your conversation is reduced to both “kindergarten” language and concepts? Or how many times have you heard the following? “You seem so intelligent! You could be doing anything! Why in the world are you “wasting” your time fixing cars?” It is taken for granted that no one would choose this profession willingly! To a large degree the credit for the execution, or character assassination, of our national professional identity goes to the local and the national media, both print and electronic. We are, after all, one of this nation’s easiest targets. It seems that every time the news gets a little slow or there is a new State program such as Inspection & Maintenance, all the local news media trot out a “bugged” car, or write articles complaining about automotive service rip-offs. And we are so disorganized, or so busy surviving from day to day, that we allow them to get away with this kind of treatment and abuse. And trying to get equal time, if any of you have ever tried, is almost impossibility. Again, that brings us back to the question, How can we make that youngster, just out of High School, feel good about what he is doing when everything that he reads in the newspaper or magazines and everything he hears or sees on the television or the radio is telling him that he is a mouse studying to become a rat! There is another problem which I have felt as both a garage owner and as an instructor, both in my shop and in the classroom, and that is the pressure which this shortage of trained manpower has put on the shops which do try to have competent personnel and which do try to do the most professional and meticulous work possible. Regardless of how important we might all agree the necessity for ongoing training is, we must also agree that the expense of taking a man out of the shop for a day, or two, or three, or more, is almost prohibitive. We must also realize that school or training in the evening is difficult at best. Anyone out there who had done this kind of work knows how physically and mentally spent one can be at the end of a ten or twelve hour day spent working on cars. As difficult and expensive as these alternatives may be, we must also agree that the cost of an untrained man in the service bay is the most expensive alternative of all. Both to us as businessmen and to our industry. It represents a serious threat to our very survival! These dilemmas leave us with a number of choices that compromise needs with desires and the real with the ideal. We know a compromise is a solution which is reached where all concerned agree, and yet no one is really satisfied. Those of us that can, train in our own shops, during and after business hours, as both the situations and the needs arise, while others take advantage of outside sources for training and certification. The tensions and the frustrations I have been referring to do not affect just the independent alone. They know no boundaries. I know for a fact that these are problematical for the dealership as well as for the independent because I have done fault diagnosis and repair for two of the factory dealerships in the town in which I both live and work. We who are involved in the automotive repair industry today recognize the fact that the dealership is not the only place in which to receive quick and competent service. We already know that not very dealership can fix every car. We already have come to realize that dealership technicians are not necessarily smarter, better trained or more highly skilled than we are. Due to the kinds of realities consumers may face trying to get their vehicles repaired, they are usually frustrated and angry when we get to see them in our service bays. They don’t understand why they can’t get their cars repaired “like they used to.” They can’t understand why the drivability problems or symptoms they try so hard to explain seem to be ignored. They resent being told that the car “is supposed to run that way” when they know, deep down inside, that it is not. They will not accept the fact that a “Check Engine” light is supposed to come on for no apparent reason. They don’t understand their warranty, especially as it applies to the emission control components on their vehicle. And they don’t understand the electronics that are quickly becoming such an integral and important part of the smooth operation and the normal running of that vehicle. They don’t understand Electronic Engine Controls at all. All they really want, and in this respect they really are no different than you or I, is to get vehicle on the road as quickly and efficiently as possible and at the least possible cost. That is not the case, however. From what I have read in the history books and from what I have seen in my own lifetime, there is no problem that is insurmountable and no such thing as impossible. In the face of all of our anxieties and tensions and despite all of the pressures, I think we have done one hell of a job keeping America’s wheels turning every day. It seems odd, though, that one of the most plausible reasons I can come up with for almost all of the ills which seem to befall our industry has within itself the most obvious answer, the most reasonable solution. In no other major industry I can think of, is there missing a trade organization comprised strictly of the individuals who populate that profession. Now, I don’t want to panic anyone into thinking that I am referring to a union. I am definitely not. I am referring, however, to something more on the order of the old trade or craft’s guilds of Europe a few hundred years ago. It was with these guilds that the health and the perpetuation of a craft rested. 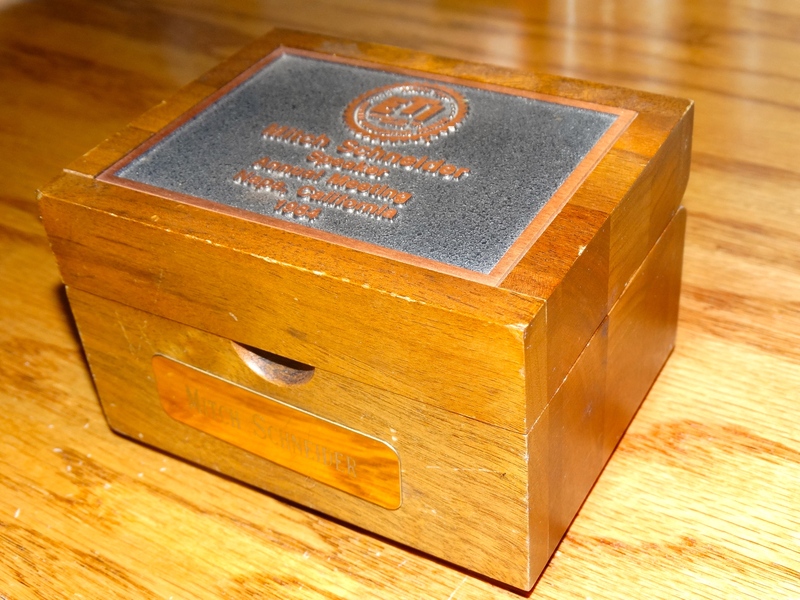 It was the responsibility of the guild to insure the overall quality of the workmanship of its membership, and to take an active part in the recruitment and the training of those responsible for its future. It was the responsibility of the Guild to determine a training regimen, a curriculum, of what was to be learned, how it was to be learned, and in what order or steps. It was also the responsibility of the Guild to insure that this material was, in fact, learned. Think for a moment. There are associations of every shape and every kind throughout the society. They are comprised of almost every conceivable group that comes to mind… except the professional automotive service technician. I believe it is through this conspicuous absence that all of our problems can be traced. As technicians, we have abdicated control over our portion of this industry to anyone and everyone but ourselves. We have learned to react rather than to act and suffered dearly for it. As a group, we have learned to become dependent upon every one except ourselves to take care of our problems for us, and we have, consequently, suffered when the job did not get done properly or did not get done at all. Due to our lack of organization we have been an easy target for the media. We, as a group of technicians, have depended on anyone and everyone other than ourselves to take up our fight and to present our defense, to determine what we need to know and how best to teach us. While it might seem plausible that the aims and the goals of the Automotive Service Council or the Independent Automotive Service Association would be the same as those of the independent repair technician, that might not always be the case. Aside from that, as technicians we have the responsibility to take responsibility for ourselves, for our actions and for our own portion of our industry! We seem to be victims of the Dorothy Syndrome. We are not so different from Dorothy who, in the Wizard of Oz, sought help from all those around her, only to realize that ultimately the power to achieve her goal was to be found within herself all along. We are an industry comprised of, perhaps, a million technicians. If one tenth of our number was to stand together and click our heels the sound would surely resound throughout the industry. Some people may say that this is the responsibility of the National Institute for Automotive Service Excellence. As far as I can determine, it is not. The charter of ASE has been from the onset, the voluntary testing and certification of technicians. I believe that one of the major shortcomings of our industry was that when ASE was announced and brought into being, many of the programs and organization responsible for TRAINING, testing and certification abandoned their responsibilities thinking that ASE would take over. In my opinion, it was never the intent nor was it the purpose of ASE to do that. I must also confess that I was not so different from the many who felt that, perhaps, ASE should have done some of those things then. I had hoped that certification would prove to upgrade the image of the technician. That it would provide a certain amount of pride, an esprit de corps. To some degree that did happen, but not on the scale that many of us in the field had hoped. There is a significant lack of recognition on the part of the motoring public as to precisely what a certified technician is, what the testing is comprised of and of what the test is really representative. I encourage and insist my technicians make an effort to become certified. I even pay for the registration and the testing, but when they ask me why? I have to tell them it is something that they will be doing primarily for their own self-esteem and confidence. We all watch television and we have all seen that “EVERY BODY NEEDS MILK.” Well, everybody who owns a car or two or three needs a trained and certified technician as well as a responsible repair facility for both himself and for his automobiles. That is the kind of national media we need to really turn things around in our industry and to help change our image, and we need it now! It seems that at the present time, at least, there are too few commercials which show the technician as being an intelligent, articulate professional. There are too few commercials which depict him as a caring and responsible “practitioner” of an “art” requiring skill and ability, an absolute necessity in keeping our nation’s wheels turning. There are, however, far more which show or perpetuate the image of the “greasy spot” garage, complete with the “Tweedle Dee” and Tweedle Dumb” Neanderthal, hammer and crescent wrench “grease monkey,” who seems more apt to injure themselves or someone else before ever having a chance to repair your vehicle or any other! In conjunction with a change in attitude prompted by a media campaign of adequate proportion, another possible answer I see could be a Craft Association, a Guild as it were. This Guild would take the form of a federation, a Federation of Automotive Qualified Technicians, comprised of Owner/Operators and line technician employees. 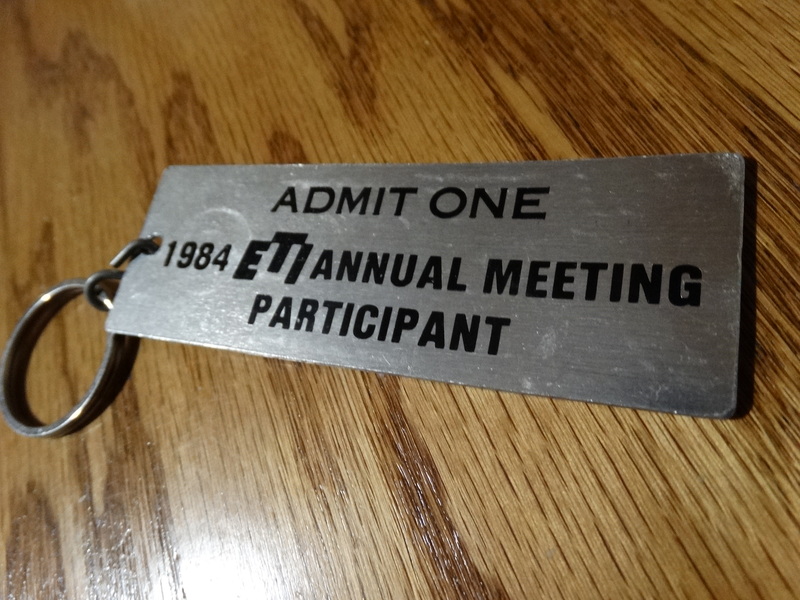 This Guild or Federation could take advantage of the foundations and ground work established by already existing, functioning and recognized programs such as ASE testing and certification, or other available and recognized sources of testing, training and certification as a means of assuring the abilities and the basic knowledge of its membership. This Federation could help share the responsibility for assuring that the curricula of both private and public vocational schools would be uniform in their presentation and in their results, that a student being trained in Wisconsin would be assured of having the same basic foundation as the student in New York or in California. This Federation would help to lobby for those things of particular interest to the technician as might relate to safety or health. This Federation would be responsible for implementing a realistic and viable apprenticeship program that would systematically and intelligently take entry level personnel and create first Journeyman and then finally, Master Level technicians and do it with reason and with purpose. This Federation, at least as I would envision it, would ultimately pursue the mandatory licensing of technicians so as to insure that the motorist would get a minimal level of dependable professional quality anywhere in the United States. There are probably some of you who think that I may have inhaled too much Carbon Monoxide, that this concept is just impossible. I disagree. I think that it is in the best interest of the industry as a whole, to have a qualified work force. I don’t believe that this work force is going to come into being mysteriously, overnight or by itself. I think the only way in which there will be significant change within the industry is if we ourselves make that change happen. I also believe very strongly that it is time for the technician to take an active part in his own professional life. I don’t propose that this change will happen without your help, however. It will certainly take the combined cooperation of all facets of the industry to build and nurture the kind of organization which I envision, but I think the end result will more than justify the effort. Every group and sub-group within our industry has its own ego and its own sense of political responsibility to its membership. It has its own sense of what is right for the industry as a whole and what is right for the technician in particular. The automotive repair technician is at the bottom of this pyramid. Whatever action is taken by any group in our industry, whatever action is taken by any arm of our government, this independent repair shop owner and the automotive service technician will have to deal with its implications and ramifications. It is time that the automotive technician take his place of responsibility along with every other section and every other facet of our industry. It is time that he no longer look helplessly to someone else to do his work for him or to fight his battles for him. We are not unlike passengers on a life raft, lost somewhere out at sea. Our survival depends on our ability to work together. Despite the fact that we all have our own personal agendas, that what we perceive and act upon has an affect seemingly on our own little portion of the world, we are all part of the same industry. It is doubtful if we can survive as well alone, as we all might survive if we work together. Whether it is dealership, manufacturer, independent garage owner or technician, we all work, as I have said before, for the same individual, the automobile owner. Those of you here in the Napa Valley, at this meeting of the Equipment and Tool Institute, are the elite of our industry. You have demonstrated your leadership and your sense of responsibility. It is time now to confront this crisis which is manifesting itself in so many ways and take control in the writing of our own collective history, take responsibility for the engineering of our collective future. I am here to ask you, if the professional automotive repair technician is not for himself, who will be there for him? If he is only for himself, what is he? But, perhaps most important, if a change is to occur in our industry, If not now, when? Some of us in an endless loop of mind numbing sameness. 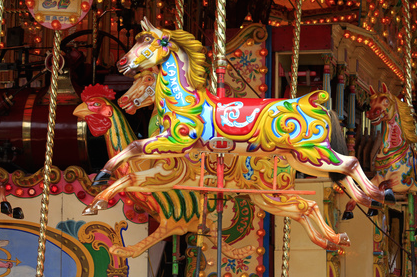 We’re riding the carousel of life, but the thought of stepping off while that carousel is set in motion is terrifying. We know that where we are is not where we’d like to be just as certainly as we know that doing the same things we’ve always done, the same way we’ve always done them can only result in getting what we’ve always gotten. Some of us are locked in place – frozen in time and space – afraid to move. We know that where we are and what we’ve got isn’t working… And, yet the fear of attempting something new, stepping out of the darkness into the light, is greater than the pain we experience when we fail to act. I’ve dealt with change and changing technology for almost fifty years: changes that have forced me to step off one carousel on to another, forced me to break the Inertia of Rest and leap from comfort to chaos, from the familiar to the unknown, onto that carousel regardless of how fast it may have been moving. I’ve made New Year’s Resolutions I haven’t kept, started diets that haven’t lasted, implemented programs that languished, projects that were never finished and made promises – mostly to myself – I never kept. I beat myself up mercilessly for the inability to move forward until I felt compelled to do something about. So, do something I did! 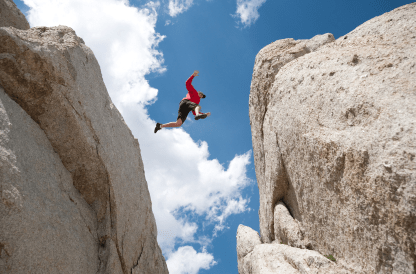 I dived deep into what has currently come to be know as “The Knowing Doing Gap” until I finally surfaced with some answers that made sense… at least, to me. I’ve published it in the trade publication I write for, shared it with other shop owners in seminars across the country and now I’d like to offer it to all of you. This process of moving from foundation to pinnacle is best visualized as a kind of Knowledge Pyramid. 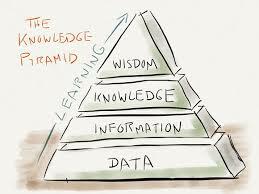 Once you can see how data becomes information, information: knowledge; and, then, how knowledge can lead to wisdom and then action, you can move from a pyramid to a funnel. 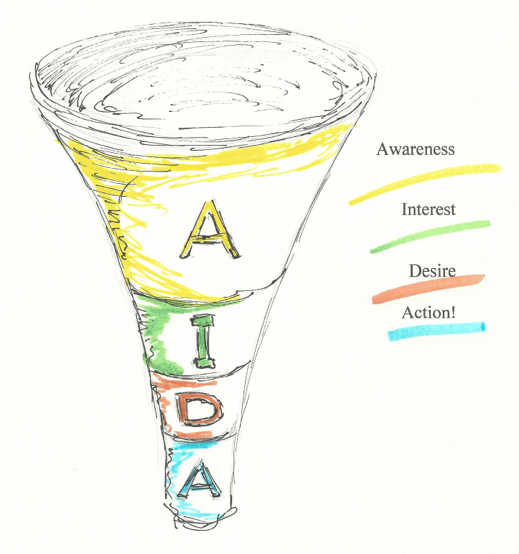 The funnel represents what marketers refer to as “AIDA: The Hierarchy of Readiness.” You may not be aware of it, but I’ll bet you’ve been victimized by it more than once and it works something like this. No one does anything unless or until they are made aware. Without awareness whatever product or service, principle or concept we can conceive is non-existent – at least, it is to us. Once aware, we can decide whether or not whatever it is we have just been exposed to is of interest to us. If it is, we are likely to desire more: more knowledge, more information, more access, more availability… And, that desire will more than likely result in some kind of an action, generally the action the marketer or advertiser that created the awareness in the first place would like you to take. Why begin a discussion of getting yourself unstuck with a journey into epistemology or marketing? Because understanding the psychology that operates beneath the surface causing us to get stuck in the first place is the first step in getting ourselves unstuck! The problem with awareness, interest and desire is that is can often lead to frustration: a feeling of dissatisfaction, often accompanied by anxiety or depression, resulting from unfulfilled needs or unresolved problems. Someone has something you want but haven’t been able to acquire. You have too much of something you don’t want: something your friends and neighbors don’t have to contend with. Hopefully, that frustration will fuel the need for more and better information: a quest for better answers and not the hopelessness of surrender. The problem is that there has never been a moment in time where information and knowledge have been more abundant: more readily accessible. If that’s the case, what’s the problem? We get stuck because knowing is a function of the cognitive mind: the thinking brain! It is the tiny command center that exists at the tip of the spinal column and is responsible for such basic and involuntary reactions as fear, fight, flight and procreation. It is incapable of conscious thought and has no capacity for language. In other words, it is solely and strictly all about feeling. If you’re looking for a powerful metaphor to help you better understand the interplay between the frontal cortex, the thinking brain that developed long after we climbed out of the ooze and the amygdale, the pre-historic brain; there is none better than the image of an elephant and its rider. 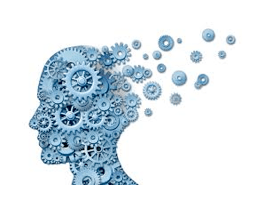 Despite what most of us would like to believe, the cerebral cortex: the area of the brain responsible for just about all of the higher order intellectual functions we too often take for granted like language, information processing and reason can be thought of as the Rider. 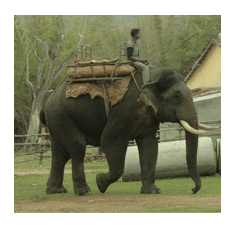 The Rider believes – or, would like to believe – he or she is in charge, capable of driving the Elephant where the Rider needs it to go. The Rider is all about reason… The Elephant, all about emotion and motivation… One represents the Rational Self: the other, the Emotional Self. The Emotional Self is instinctive, reactive, unable to communicate through language, focused on pain, pleasure and procreation, seeks immediate gratification and is reliably unreliable! The Rider knows we should eat more responsibly, exercise regularly, avoid stress and should not smoke. The Elephant is drawn to comfort and tied to the chemicals released the moment you even look at a glazed donut or a chocolate éclair. It has no interest in reason and as a result cannot be moved by data, information, knowledge or wisdom! And, since the Elephant is exponentially larger and more powerful, the Rider is headed wherever the Elephant is likely to go! To get unstuck: to move from thought to action, the Rider and the Elephant must agree! The destination must be absolutely clear. The Rider must have a reason and the Elephant will require motivation. And, did I mention that the path must remain unobstructed at all times? The bottom line is: Doing something actually requires doing something! In order to break the Inertia of Rest you must take action even if taking action moves you in what might seem is the wrong direction. The reason is simple, it’s easier to correct your course than it is to move away from the dock! It’s easier to change the Elephant’s direction than it is to get it to take that first step. Learning from what might outwardly be considered a mistake is ultimately better than remaining paralyzed and doing nothing at all. Chances are, you’ve failed before and experienced all or many of those fears without mortal consequence. In other words, you’ve lived to fail again! What we all should be terrified of is the fear of doing nothing at all: the fear of falling without the strength or character to get up again. The secret is to resist the urge to fall prey to “Analysis Paralysis.” Collect as much data as you can. Allow it to simmer until it begins to look and taste like information. Turn that information into knowledge and that knowledge into wisdom and then use that wisdom to choose the right course of action. And, once the decision to act is made… don’t look back! If you are continually waiting for the best information to help you make the best possible decision in order to take the best possible action you are likely to be waiting a long time: possibly forever! Sooner or later someone will have to pull the trigger and jump! If you’ve done the best you could and made the best decision possible with the information available at that moment in time, let it go! Stop waiting for the “best time” to take action, begin a project, stop smoking, change your lifestyle, start saving, begin a new workout regimen. The best time to do any of that is right now! Don’t fall backward into the trap of doing what you’ve always done! Change is uncomfortable and damned hard work! Doing what you’ve always done the same way you’ve always done it can only get you one thing: the same result you’ve experienced in the past. If that was good enough you would have abandoned this article long ago! There will always be a perfectly good reason to wait (see: Analysis Paralysis). The more challenging and risky the course of action… the more unfamiliar the territory, the easier it will be to for you to find a reason to hesitate. That isn’t a license to charge off into the sunset without doing your due diligence. Gather all the information you need, consider all the options available, list all the possible consequences: both known and unforeseen. And, then decide on a course of action and get started! Courage is not the absence of fear. 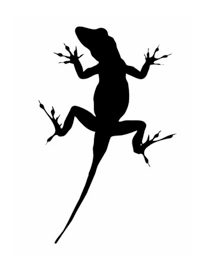 It is the willingness to take action despite that fear… Consequently, the opposite of courage is surrender and both fear and surrender belong to the Lizard! Realistically, there is no right time to confront your fears and the reality of life is such that doing anything you’ve never done before will be terrifying, which is probably why you’ve never considered doing it before! The importance of how we communicate with ourselves cannot be overstated. It is doubtful that anyone has ever taken action based upon a belief alone. Beliefs live in the realm of the Rider’s frontal cortex. They are intellectual: based on reason and grounded in information and in and of themselves, that is exactly where they will remain. In the context of this discussion, a belief is not the same thing as a decision. Believing something is no guarantee a desired action or even an undesired reaction will result unless or until the decision to take action upon that belief manifests itself. The magic occurs when data and information are transformed into knowledge and wisdom, that’s when BELIEFS are transformed into DECISIONS. When and only when decisions are made… will things begin to happen! Take action and remember that taking action actually requires that an action be taken! And, try to remember that talking about doing something is not the same thing as actually doing it (And, neither is planning)! Take inventory of where you are. Create a ‘snapshot’ of where you are so you can establish mile-markers along your route to recognize and celebrate just how far you’ve come! Give up on perfection… It’s over-rated! There are times when perfection can become the enemy of greatness. When you’re stuck, desperately trying to get unstuck, achieving good even though it might be the enemy of great, just may be good enough to get you moving! But, not more than three (3) things! Prioritize them in their order of importance… to you. And, then pick the one likely to result in the greatest and most immediate return so you can begin building on your successes! Find someone to hold you accountable for your decisions, someone who will poke, prod and even ridicule you if or when you fail to act. The only thing more effective than having the right accountability partner would be to post your decisions publically, creating an army of accountability partners, so the fear of disappointing them is greater than the fear of getting started! The only thing that has ever worked for me is focusing on that vision of a better future and then working backwards to document the steps that would have to be taken in order for that vision to become reality. They may sound like the same thing, but they’re not! 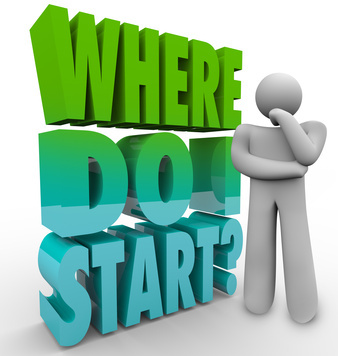 One starts at the beginning and requires that we establish what that ‘first step’ should be and the other begins at the end, which makes establishing what the ‘first step’ had to be in order to get where you’re going a lot easier ! Don’t beat yourself up if at first you are unsuccessful! Everybody trips… Everyone stumbles… And, just about everyone fails from time to time! The old adage is true: Nothing ventured, nothing gained! And, nothing is ever ventured without risk! Be kind to yourself! Don’t obsess! Don’t play the ‘Blame Game.’ Don’t stress out! Just stop and say: “What can I learn from this…” And, then, move on! Practice: Do – Fail – Fix! If it works, great! Keep doing it until it quits providing the desired result. If it doesn’t, stop doing it! Determine what’s broken: why it isn’t working and then come up with a plan to improvise, adapt and overcome! In other words, a plan to FIX it and then lather, rinse, repeat! I hope you’ve enjoyed exploring this topic as much as I have. The only thing that would make it more enjoyable would be your participation: your reaction and comments. So, resist the urge to wait or let it go till you have time. Get “unstuck” and drop me a line! I’m really interested in what you have to say!